Tansee iPod Transfer is a sound of blessing for frustrated Apple’s iTune users who can’t copy music files from iPod to pc desktop or laptop since iTune blocks iPod-to-computer song transfer. 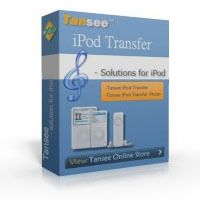 With Tansee iPod Transfer, iPod users can transfer iPod Songs to PC easily. Tansee iPod Transfer utilizes iPod’s internal database to display your iPod’s files instantly.